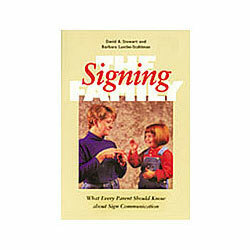 The Signing Family shows parents how to create a set of goas for signing centered around the needs of their deaf child, then describes the major signing options available: American Sign Language, Signed English, Signing Exact English, and Contact Sign. Parents will learn how each signing method originated and why it was created. Also they will learn their legal right in the education of the child and how to work with schools to provide their sign preference in the child's classroom. This book is an excellent resource for parents who are searching for answers.